Disclosure: I received a free bottle of Pompeian Extra Virgin Olive Oil to test and use in a recipe. I also received a $10 gift card to Wal-Mart to purchase ingredients for recipe creation. All thoughts and opinions are my own. I love olive oil. It is my go to oil for most cooking applications – baking, marinades, salad dressings, etc. I even add a drop or two of olive oil to my smoothies for some healthy fats. High in monounsaturated fats, olive oil is heart healthy and a major component of the Mediterranean diet. There is also research underway to see if olive oil may improve memory and possibly help prevent cancer. So I was more than happy to try out Pompeian Extra Virgin Olive Oil when asked to do so. Of course I am familiar with the Pompeian brand, and I’m sure I’ve bought it before, but it was nice to reacquaint myself. One of the great things about Pompeian is that it carries both the USDA Quality Monitored Seal and a quality seal from the North American Olive Oil Association, which certifies that the olive oil meets the standards set for olive oil. In other words, there really is olive oil in the bottle! Unfortunately that is something you have to worry about these days. Not all bottles of olive oil are really just that. So if you want to reap the health benefits of using olive oil, you need to make sure that you are in fact buying it. Other things to look for is that the bottle is dark green or dark in color to protect the oil from light, which can degrade the oil quickly. As for the flavor, the Pompeian has a lovely aroma and flavor that stays with you. To be honest, I don’t know exactly how to describe it, but there is certainly a peppery olive smell to the oil that carries over to the tongue. It tastes the way I expect a good olive oil to taste. On the bottle it is described as having a robust flavor, and I believe that to be quite accurate. I have used the Pompeian in a homemade balsamic vinaigrette, a pork loin marinade and in the Rosemary Olive Oil Bread below, all with wonderful results. 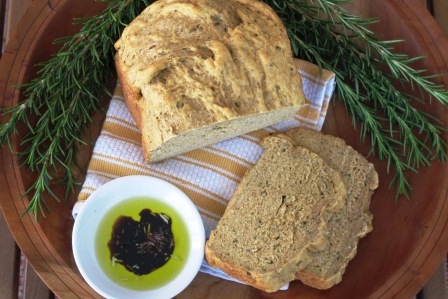 I first came across this recipe for Rosemary Bread about a year ago and I have been tweaking the recipe ever since. It is also a great way to put my monster rosemary bush to good use! I think I have finally perfected the recipe, and made it much better in the process. The Pompeian Olive Oil definitely gives it a nice note, which is quite smooth and balanced. It is still understated, however, and not overwhelming. Serve it with a dipping bowl of olive oil, a drop or two of balsamic vinegar and some freshly grated Parmesan. Heaven. 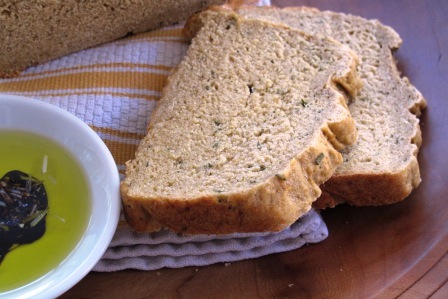 Place ingredients in the pan of the bread machine in the order listed above or as recommended by the manufacturer. Select the whole wheat cycle and press start. 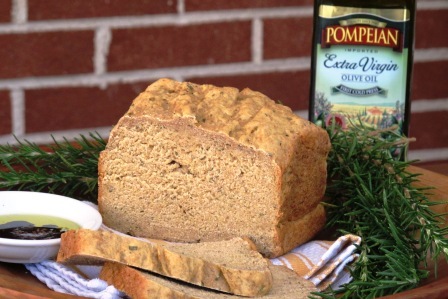 Want a coupon to try Pompeian Olive Oil for yourself? You can find it here as well as more information about the brand.